Deal done on CapX Bemidji-Grand Rapids? A group of five utilities is negotiating with the Leech Lake Band of Ojibwe to buy right-of-way for a 230-kilovolt power line – connecting Bemidji and Grand Rapids – across the tribe’s reservation. Fergus Falls-based Otter Tail Power Co., the lead developer on the transmission line, is among five electric utilities named on a draft settlement agreement with the Leech Lake Band. Finance & Commerce obtained a copy of the draft settlement from a source close to the situation. An Otter Tail Power spokeswoman earlier this week conceded that the company was in talks with the tribe, but said the talks did not represent formal negotiations. The draft agreement and addendum also encourage utilities to hire tribe members to provide security and, when appropriate, purchase project materials from the tribe. And what are you doing October 11-12? How about going to an EUCI-PowerMarketers shindig in Chicago to give the industry a clue about siting transmission and what Capx 2020 is really about? Note the intervention deadline — September 2, 2010! Sibley County will have new electrical transmission lines constructed here in several years, but where they will be located has yet to be determined. Randy Fordice of CapX2020, the project that proposes a 345 kV transmission line from South Dakota to the Twin Cities, updated Sibley County Commissioners last week. Sibley County properties will be affected as part of the Brookings to Hampton Route. Sixty miles of the route from the Cedar Mountain substation to Helena substation, which includes portions of Sibley County, has not yet been determined because of the uncertainty where the power line will cross the Minnesota River, either at Le Sueur or Belle Plaine. Although the Le Sueur crossing is in the preferred route, the U.S. Fish and Wildlife Service believes there would be less of an impact on eagles at Belle Plaine, according to Fordice. The Office of Energy has recommended the Belle Plaine crossing. More hearings will be scheduled in the future, and Fordice anticipates this area of the route will be set either later this year or early next year. The majority of the preferred route, from west of Winthrop east, is located south of Highway 19. In the Gaylord area, the preferred route would be just north of County Road 8. The alternate route would be north of County Road 10 from Highway 15, head north for about a mile on County Road 13, and then head east. One route would have the transmission lines head north on County Road 3 between Gibbon and Winthrop. Another possibility would have the line head south in Cornish Township, head east through Cornish, Alfsborg, and Sibley Townships, and then head north along County Road 13 in Sibley and Dryden Townships, head east along Highway 5, and then head north a couple miles west of Arlington. Affected landowners will be contacted for easements in 2011. The routes have 150 foot right-of-ways. The single pole structures would have three conductors on each side, and would be located about 1,000 feet apart. Bill Glahn, of the Minnesota Office of Energy Security, has denied the NoCapX 2020 and United Citizen Action Network appeal of his scoping decision for the CapX 2020 Hampton-LaCrosse (Alma) transmission project. No surprise, but the agency’s steadfast refusal to join with the USDA’s Rural Utilities Service to do an Environmental Impact Statement just leaves me shaking my head. Oh, and of course there’s a bit of steam coming out the ears! 4410.3900 JOINT FEDERAL AND STATE ENVIRONMENTAL DOCUMENTS. title 42, sections 4321 to 4361.
requirements as well as those of state laws so that one document can comply with all applicable laws. Subp. 3. Federal EIS as draft EIS. If a federal EIS will be or has been prepared for a project, the RGU shall utilize the draft or final federal EIS as the draft state EIS for the project if the federal EIS addresses the scoped issues and satisfies the standards set forth in part 4410.2300. Seems the ALJ doesn’t think it’s a problem to have the Final EIS come in and that the public not be able to comment on it. Seems the ALJ doesn’t acknowledge that in the Brookings case the record was expressly left open to allow comments on the FEIS, and that comments were allowed in after the record closed, both in Brookings and in St. Cloud-Monticello. He says that if we want to comment on it, we can address that in “Exceptions” directly to the PUC. 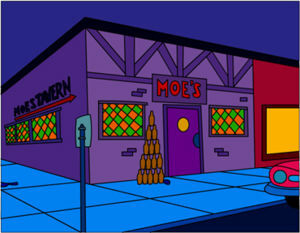 Well, we’ve seen what happens with specific and numbered Exceptions – MOES disregards them, says they’re not in compliance with the rules (EH?) and the PUC never learns what was proposed. 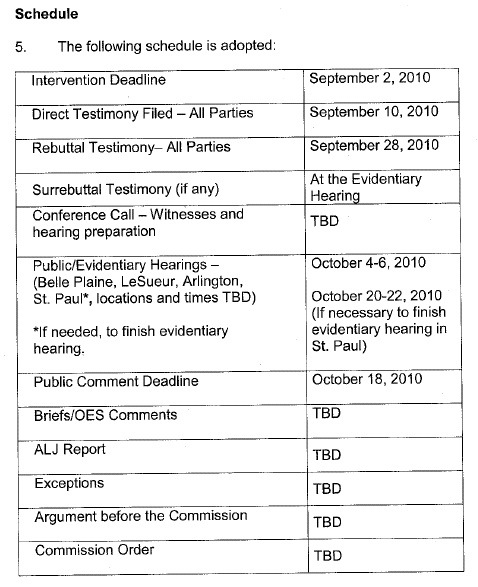 The Commission directed that the ALJ reconvene the hearing for consideration of additional evidence regarding the Minnesota River crossing by the proposed High Voltage Transmission Line to run from Brookings, South Dakota to Hampton, Minnesota, in particular whether it is preferable to cross the Minnesota River at Belle Plaine or at Le Sueur and which crossover route is preferable (if a crossing at Belle Plaine is preferred). Persons participating in the Prehearing Conference should be prepared to address the question of how best to proceed on remand and discuss time frames, scheduling, and procedures for soliciting and receiving public comment on the remanded issues. Monday was the Prehearing Conference for the CapX 2020 Hampton-LaCrosse/Alma transmission line. NoCapX 2020 and U-CAN are the only parties thus far – CETF was missed! The Prehearing Conference was to discuss the schedule. We had some observers, one from the church and school in Cannon Falls that CapX wants to run right over, another with property and developed land in Wanamingo, two from the “North Route Group” and the ever-present Dave Seykora of the DOT. For an hour, we went round and round and round, and it seems to me that ALJ Sheehy is just getting a taste of what she’s in for, a taste of what she wasn’t quite aware this project would entail. She’ll issue a Scheduling Order sometime soon… We’re off to the races. Notice for landowners. It was a problem in Brookings, because in scoping and through the Task Force process, additional landowners were affected, and although the scoping decision was released in that project on June 30, notice didn’t go out until mid-September, or even later for some landowners. Recognition of this problem and rectifying it would help. But nooooooo… MOES defensively relied on “there’s no rule that would require that” and said “the DEIS would be out by early 2011 and the hearings weren’t until June,” say WHAT??? The scoping decision that has additional routes and additional associated landowners was out last Friday, August 6, 2010, and you think it’s OK that landowners not get notice until the DEIS comes out? No, that is NOT acceptable. Thankfully, Matt Langen was on the ball and said that notice was going out this month, he was already planning that. GOOD, that works. Intervention Deadline – sure, theirs is OK as long as there is an extension to provide opportunity for landowners who are drawn in later, who don’t get notice, to intervene. Public Hearings – they’re only scheduled for Plainview, Pine Island, and Cannon Falls. EH? What about Kenyon/Wanamingo? What about Winona and on the way to the Winona river crossing? What about LaCrosse and on the way to the LaCrosse river crossing? It’s quite a ways from Kenyon/Wanamingo to Pine Island or Cannon Falls, but not according to MOES’ map. It threw up red flags for me because there were NO hearings in Belle Plaine. By this plan, there are no hearings along that alternate route going down to Kenyon area and then east parallel to 60, and that’s a BIG area not to have any hearings. RUS EIS. This is a big deal. The Rural Utilities Service, an arm of the USDA, is financing the Dairyland Power part of this, and because federal funding is involved, they’re doing an EIS. Unlike the Bemidji-Grand Rapids CapX line, which is doing a joint EIS with RUS, and contrary to Minn. R. 4410.3900, which requires that the state and feds work together, MOES AND RUS ARE NOT WORKING TOGETHER ON THE ENVIRONMENTAL REVIEW FOR THE HAMPTON-LaX (ALMA) TRANSMISSION LINE. We need the RUS information in this docket, to be incorporated in if MOES is not willing to do a joint EIS, which from what I can see thus far, that they’re not even willing to acknowledge in the scope or the Task Force reports that RUS environmental review is ongoing, I’d say they’re not willing to do this willingly, OK, fine, let’s have at it. Today NoCapX 2020 and United Citizen Action Network have filed a Motion to Intervene in the CapX Bemidji-Grand Rapids case. Why? 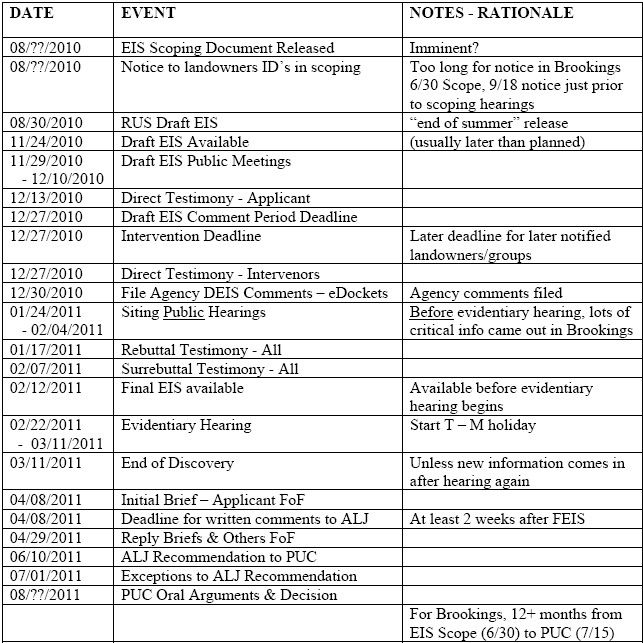 Because the comments of the EPA show that there are serious problems with the EIS and that issues raised may well be determinative of the route, as they were in the Brookings case, where similar info came out way too late to take into account in routing, leading to a bogus routing process and remand back to the ALJ. READ EXHIBIT A – EPA COMMENTS BELOW ON THE BEMIDJI-GRAND RAPIDS EIS – OH – MY – DOG! Looking at the EPA comments, and of course, what else is there from other agencies who must be as concerned, it seems MOES isn’t able to put together an EIS that can pass federal scrutiny, that is up to federal NEPA standards. Is it any wonder that they don’t want to do environmental review with RUS on the CapX Hampton-LaX (Alma) line? Affidavit of Overland – unexecuted – will file notarized SOON! Governmental units shall cooperate with federal agencies to the fullest extent possible to reduce duplication between Minnesota Statutes, chapter 116D, and the National Environmental Policy Act, United States Code 1976, title 42, sections 4321 to 4361. Where a joint federal and state environmental document is prepared, the RGU and one or more federal agencies shall be jointly responsible for its preparation. Where federal laws have environmental document requirements in addition to but not in conflict with those in Minnesota Statutes, section 116D.04, governmental units shall cooperate in fulfilling these requirements as well as those of state laws so that one document can comply with all applicable laws.